Macedonian President Gjorge Ivanov is urging Macedonians to boycott a popular vote on whether the country should change its name. He called changing the country's name from the Republic of Macedonia to North Macedonia "historical suicide." 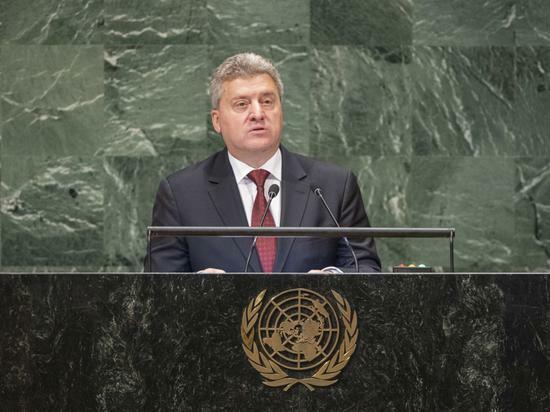 Ivanov spoke at the United Nations General Assembly in New York City. He said, "It is a censorship of the world and an auto-censorship of the collective conscience of Macedonian people." Ivanov has refused to support a deal reached between Macedonian Prime Minister Zoran Zaev and Greek Prime Minister Alexis Tsipras. Under the deal, the people of Macedonia will vote on whether to change the country's name or not. The Associated Press reports that it is unclear if 50 percent of voters will take part in the referendum, which is required for the vote to be official. If voters do support the change, parliament will have to change Macedonia's constitution. Ivanov has called the deal a clear "violation of sovereignty." He criticized the vote saying: "This referendum could lead us to become a subordinate state, dependent on another country." He added, "We will become a state in name only, not in substance." Greece has said that the name Macedonia belongs only to its northern province of Macedonia. It says by using the name, the country of Macedonia can make a claim to the Greek province. Since Macedonia became independent in 1991, Greece has put pressure on it to change its name. Because of the Objections of Greece, Macedonia is known as the Former Yugoslav Republic of Macedonia in the United Nations. Greece also has blocked Macedonia from joining the North Atlantic Treaty Organization, or NATO. Supporters of the name change say it will lead to NATO membership and permit the country to join the European Union after a set time period. Opponents consider the change a national humiliation. On Sunday, September 30, the people of Macedonia will vote on whether to change their name to North Macedonia. Several factors will put pressure on food prices. 5.The Associated Press reports that it is unclear if 50 percent of voters will take part in the referendum, which is required for the vote to be official. He will take part in an important race across the Atllantic. My friend and I take part in sports like tennis,badminton and swimming. 6.It says by using the name, the country of Macedonia can make a claim to the Greek province. We will need that number if you need to make a claim. To make a claim, you must specify the date when the article was lost.